Excellent Condition cosmetically - has spent most of it's life sitting in a rack at my home, a few very minor insignificant cosmetic marks on the black part of the body and edges of rack ears which are not visible when screwed in a rack. Comes with original box, packaging etc. 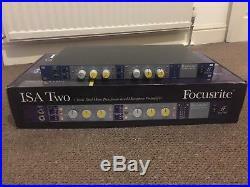 Two Channels Of Classic Focusrite Mic Pres. Focusrite's ISA Two brings together a totally independent pair of classic ISA microphone preamps from the original ISA 110 module, combining the best of traditional solid-state electronics with the original input transformer specified by Rupert Neve the Lundahl LL1538. Each mic pre has the option of mic, line or the front-panel instrument input, with variable input impedance to ensure you are getting the best performance from the source. Up to 60dB of gain is available on the first four-position rotary and gain range switches, with a further +20dB of continuously variable trim, meaning a huge 80dB of gain is available should it be required. The high-pass filter features variable cut-off frequency between 16 and 420Hz. A pair of 8-segment LED meters show peak signal level in dBFS, while a rear-panel pot allows calibration to suit your A-D converters. Rear-panel insert points allow the use of inline processors such as compression. Classic ISA mic preamp design featuring Lundahl LL1538 input transformer. Dedicated TRS line input socket with front-panel switch. Switchable input impedance including classic ISA 110 setting. 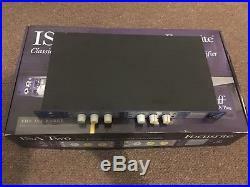 The item "Focusrite ISA TWO Dual Channel Microphone Pre Amp EXCELLENT CONDITION" is in sale since Tuesday, February 20, 2018. This item is in the category "Musical Instruments\Pro Audio Equipment\Preamps". The seller is "diskobox99" and is located in Stockport. This item can be shipped to United Kingdom, Austria, Belgium, Bulgaria, Croatia, Cyprus, Czech republic, Denmark, Estonia, Finland, France, Germany, Greece, Hungary, Ireland, Italy, Latvia, Lithuania, Luxembourg, Malta, Netherlands, Poland, Portugal, Romania, Slovakia, Slovenia, Spain, Sweden, Australia, United States, Russian federation, Canada, Brazil, Japan, New Zealand, China, Israel, Hong Kong, Norway, Malaysia, Mexico, Singapore, South Korea, Switzerland, Thailand.